There is something badly wrong with these blokes. They appear to have lost all the survival and re-active instincts that make a surfer a different animal to, say, a tennis player. Not that there is anything wrong in being a tennis player, apart from having to play chase the little ball in a cage wearing white sandshoes and white socks. But if it doesn’t hurt too much then do it often, my motto. – or golf .. what is it with all these games that involve chasing balls? Tennis, golf, cricket, marbles, rugby, handball, soccer, polo, basketball, baseball, billiards, pool, water polo – not to mention the funny clothes you have to wear to get a game. This is human behaviour well out of order. Back to the longboarder and his club. < The longboarders all arrive at the beach at the same time, they bring their wives and children, their cooking apparatus, sausages, buns, chops, onions, tents, loudspeakers, scoreboards, tables, chairs, prizes, awnings, towels, hammocks, hats, changes of clothing and of course, their boards. A multiplicity of abominations. A serious series of infringements. The simple act of slipping down the beach for a wave morphed into a picnic with the relos* under the pines. and do you see one here? A board? No? – neither do I, and that’s a real worry. Not only that but these blokes are so far removed from the basic tenets of surfing they can’t even see the surf from the cook tent. How could that happen? – and what’s with all the BIG HATS? They must like walking around in the dark. There was a strong rumour about the northern beaches last year about an ‘ official ‘ of the Palm Beach Longboarders who was seen in the scorers box, on the internet consulting Swellnet**. He was checking the weather conditions for the rest of the day. He should have taken off his BIG HAT and looked up at the sky. 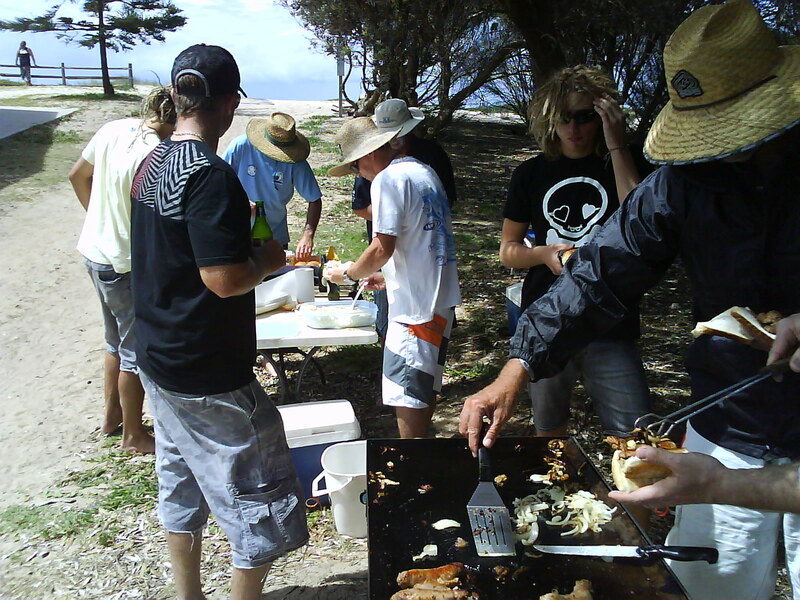 The only item here ^ that shows any link to the proper surfing standards we all strive to live by is the quality of the food they are preparing. Greasy meat and greasy onion slapped onto a stale bread roll, though even here we have a couple of unforgivable omissions – where is the tomato sauce, the meat pies, and bananas – surfers always eat bananas, and watermelons. Where is the beer? These are some serious lapses. There are too many normal people surfing these days, they have a serious lack of attitude and no longer offend nearly everybody they meet and attract the consequent social ostracism that was so welcome in earlier days. Something should be done, by someone, soon. MY god, yes! And why do they insist on being SO goddamned friendly?? If I wanted more Friends out the back, I’d live on Oxford Street or go to prayer meetings. And saying g’day back means a touch more guilt when I snake the prick. Not that I’d ever snake anyone.